Public schools are a popular location for making presentations to large groups inside and outside of classrooms. Principals, teachers, and guests are constantly speaking to audiences about topics ranging from safety, education to personal development. Although most speakers prepare in advance, occasionally presentations occur because of an unexpected incident in the school or a significant world occurrence. Although most teachers will not require a lectern in their classrooms, the ProProducts’ lecterns are affordable, so our lecterns are ideal for teachers who prefer using a lectern while they teach. 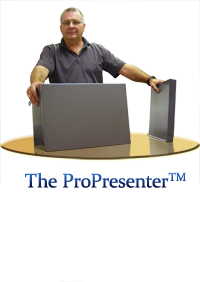 We also offer a ProPresenter table top lectern, which can be easily positioned on a desk. No matter the occasion, a portable lectern or table top lectern can help a speaker look prepared, competent and knowledgeable about his topic. Our lecterns include two media portals that allow school speakers to use a microphone, computer or other technology with the lectern. The convenient media portals help keep wires out of the way, so speakers can interact with their audience without worrying about tripping over stray cords. Our ProProducts’ portable floor lectern features a cabinet that allows speakers to stow paperwork and props out of the way until it is time to use them. This keeps distractions to a minimum and also provides additional space to display notes while you speak. Giving a presentation can also facilitate a dry mouth, but our portable lecterns and table top lecterns includes a cup holder; this allows speakers to have a refreshing beverage at their fingertips without disrupting their presentation. During some presentations, speakers may need to raise their voices to get children’s attention. An accessible beverage can help ease voice strain. Lecterns are convenient to use when welcoming parents to back-to-school night, providing professional educational tips to teachers, explaining new procedures, and introducing assemblies, plays and concerts. However, schools have limited budgets, and it may not be necessary to have a lectern in every room. 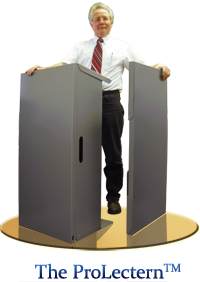 The aluminum ProLectern podium is a foldable, lightweight lectern that speakers can conveniently carry and erect. It has handles that make it simple to carry whether you are left or right-handed. Some schools are large. Hallways can be crowded, but our foldable lecterns are easy to transport even when they must be carried through a crowded hallway. Additionally, the lecterns compactly fit in a car trunk to be moved from one district location to another one. The aluminum finish resists stains and water spills, so the lectern cleans easily. The lecterns will not chip or warp, so they will not show the wear and tear of lecterns made out of other substances. Additionally, our lecterns are reasonably priced, so public schools can comfortably afford to purchase multiple lecterns. Often public schools have simultaneous presentations for different grade levels or staff. The ProLectern’s aluminum finish also makes it the ideal podium for indoor and outdoor use. Public schools often host outdoor events such as graduation ceremonies, field days, fairs and other fundraisers that may require the use of a lectern. The ProLectern’s portability makes it ideal for these events. 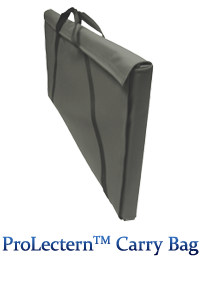 Additionally, its durable structure stands securely on any level surface. Public schools can also customize lecterns for each school within the district, so it is easy to ensure every lectern is returned to the correct school. Customizing a lectern can also help promote school spirit. Whether students, teachers, principals or school guests are giving a school presentation, they want to appear organized and competent. Let ProProducts’ portable lecterns help the speakers at your public school make the right impression.